Shooting Me Down is a non-album single from the British hard rock band Chrome Molly, released by I.R.S. Records in November 1988. It failed to make an appearance in the UK charts. The song was written by Jim Lea and Noddy Holder, and produced by Lea. Although no Slade version of "Shooting Me Down" was ever recorded, Chrome Molly remain in possession of a Holder/Lea demo version of the song. After the band's 1987 album You Boyz Make Big Noize, Slade decided to take an eighteen-month break, allowing all four members to pursue to their own interests. 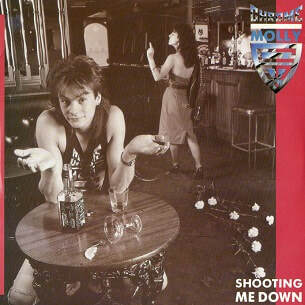 During this period, Jim Lea worked with Chrome Molly on "Shooting Me Down", a song that Lea and Noddy Holder had demoed and originally offered to Samantha Fox in 1987. In the summer 1988 edition of the Slade International Fan Club magazine, it was announced that Lea was in the studio with Chrome Molly, producing "Shooting Me Down". When Lea and the band originally agreed to work together, the idea had been for Lea and John Punter to produce one of Chrome Molly's own tracks, however "Shooting Me Down" was chosen instead after the band and their label I.R.S. saw potential in the song. The song was released as a single in November 1988 and soon gained heavy airplay from BBC Radio 1. However, the single would fail to chart in the UK, due to a dispute between I.R.S. and distributors MCA Records. Following the dispute, thousands of copies of the single were left in storage rather than being shipped out to record stores across the country. Speaking to the Leicester Mercury in 2010, bassist Nic Wastell recalled: "I'd say it was the nearest we got to capturing the true sound of the band on tape. The plan, if you could call it that, was to push it and push it, sell enough to get into the Top 40 – and then get on Top of the Pops. However, Miles Copeland, our record company boss at IRS, had a big fallout with MCA. I remember playing a gig in Bristol just after the single was out. It was a great gig, with lots of people and there was a real buzz. But we met some of the fans afterwards and they said: "We can't buy your single. We can't find it anywhere." And that was the first we knew of it. If we could have got on to the Top 40, got a slot on TOTP, then it could have gone anywhere." In a 1988 interview with the Slade fan club, Lea spoke of working with the band: "Chrome Molly sent me some of their tapes about a year ago. Basically they only had a publishing deal at that time, so I was a little puzzled and didn't know what they were asking me to do. They eventually got a deal with I.R.S. and sent me another song eight weeks ago, which I.R.S. said would be their next single. They initially wanted me to co-produce it with John Punter, which I didn't really mind. Although, what with costs of two producers plus the lack of authority in sharing the role, I didn't think it would really work out. Eventually it was agreed that I would do it on my own and I sent them "Shooting Me Down" in case they might like it. Later on I rang their manager who asked me to come and see them play. He also explained they had a bit of a time problem, so I cut short my holiday in Cornwall to see them. When we met I asked what they thought of the song, to be told it was already in the band's set and that they loved it. The record company thought it was fantastic and gave us the go-ahead to do it as the single instead. In fact, I saw them on the Saturday and we were in the studio on Monday. I didn't know the guys at all and we didn't even rehearse it, but everything went great. We completed it in three days, which is just how I like to do things. Very reminiscent of our early days as Slade - straight in, no mucking about!" Speaking of the song itself, Lea said: "Funnily enough, I've just done an interview with Kerrang! about it and they suggested that it was very much like what Bon Jovi might have done. I replied yes it probably is, but was it really like that or what Slade might have done? I told him that Bruno Brookes played "Mama Weer All Crazee Now" straight after Bon Jovi's "Bad Medicine" track the other night and he had commented that a lot of the sounds in today's rock bands were done by Slade years ago. The reporter thought about it again and agreed that a lot of American bands do sound like an updated version of Slade, which was quite a compliment!" "Shooting Me Down" had been intended for Samantha Fox. Her label, Jive Records, had approach Holder and Lea about writing a song for Fox's new album, with Lea producing it. However, by the time the pair had demoed the song soon after, Fox's self-titled album had been quickly put together for a July 1987 release. In a 1988 fan club interview, Lea revealed of the song: "Nod and I had actually written the track for Samantha Fox last year. We had been headhunted by Sam's record company and they wanted us to write a song for her, with me producing it. When we met them they told us that Stock, Aitken and Waterman had done a track with her, but by the way they were talking, they didn't seem overly struck on it. They said that there were two more songs to do for her album and asked when would our song be ready? I gave my usual reply and exclaimed "when it happens!" I went on to explain that if it was going to come into my head, I would probably just think of it when I was walking down the street. So it was impossible to give them a specific time. To cut a long story short, a couple of weeks later, Nod and I demoed the tune and sent it off to the company. Literally two weeks after that, "Nothing's Gonna Stop Us Now" was released and flew up the charts. Unfortunately, the album was hastily packaged and put out before she'd had time to record our song, so we literally missed the boat! [Jive] liked ["Shooting Me Down"] a lot and told us that they would still want to hold onto the track, but of course you could hang around forever." "Shooting Me Down" was released on 7" and 12" vinyl by I.R.S. Records in the UK only. It was manufactured and distributed by MCA Records Ltd. The B-side, "Led Heavy", was one of the band's own recordings and did not involve Lea. A 12" version of the single was released as a limited edition version, including two additional tracks: the "In Flames Remix" of "Shooting Me Down" and the band's own "Thanx For The Angst (Remix)". The single's sleeve featured photography by Charles Best. The band's main form of promotion was performing live, where they included the song in their set, and involving themselves with the music press as much as possible. Upon the single's release, a full A4 promotional advert was published in UK magazines, which labelled the song as the "storming new single, produced by Jim Lea". Chrome Molly split in 1991 but reunited in 2009. Since the band's reunion, they have performed the song live. In 2010, Leicester Mercury said of the song: "What killed them was the one thing that should have made them: their much-touted, slickly-produced, widely-publicised breakthrough single. Called "Shooting Me Down", it was a catchy, terrace anthem produced by Slade pair Noddy Holder and Jim Lea. It was a clear cut above what the band had done before." In a 2017 article by Classic Rock, the song was described as having looked like a "guaranteed smash" upon its release. In a review of one of the band's live concerts in London in 2014, the webzine Get Ready to Rock! described the song as having some "bang on the money 'whoo-ooh' gang vocals". Jim Lea - producer of "Shooting Me Down"
Trevor Hallesy - engineer on "Shooting Me Down"
Chrome Molly - producers of "Led Heavy"
Roy Neave, Kevin Nixon - producers of "Thanx for the Angst"
Don Dokken - remixing on "Thanx for the Angst (Remix)"